Kadai Paneer Recipe or Kadai paneer restaurant style dry recipe. 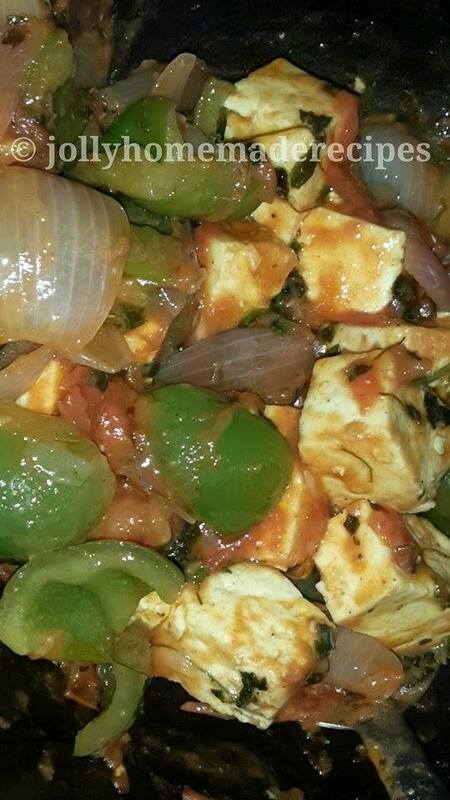 It is delicious and very easy to make paneer dish. 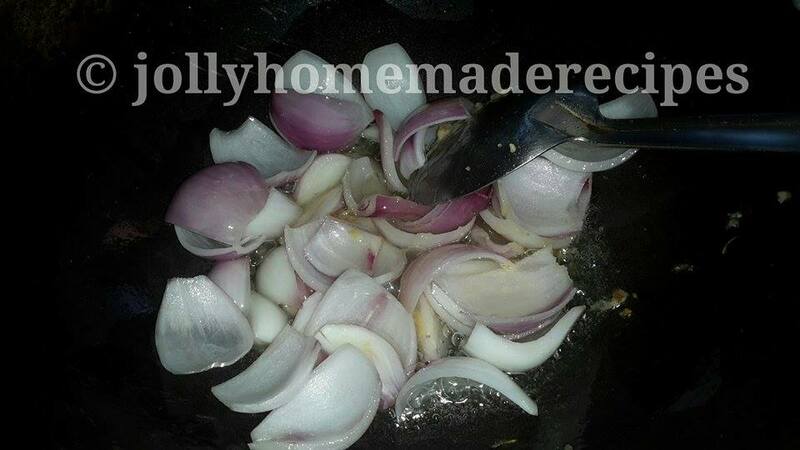 This recipe is classic North-Indian dish served in restaurants but this is purely Homemade style. 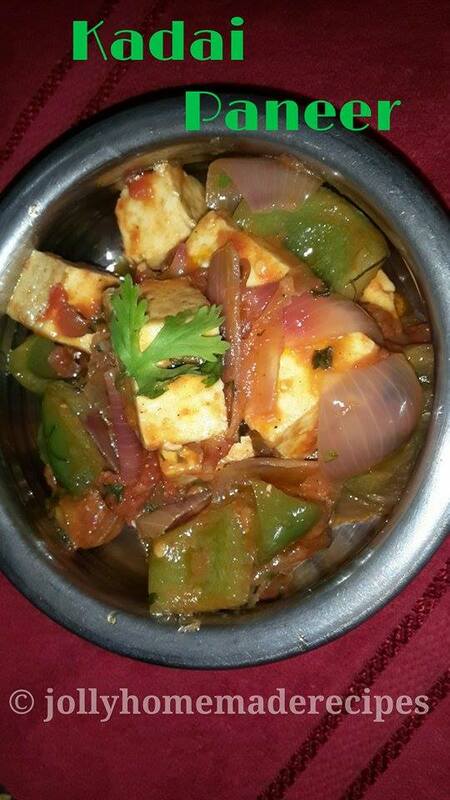 To make kadai paneer, paneer is seasoned, lightly spiced and cooked with onion, tomatoes and capsicums. Kadai means ‘Wok’ (not chinese wok but Indian wok. Some how similar. Indian wok has more depth than chinese one). Paneer means ‘Indian cottage cheese’. Kadai is used to prepare many other Indian stir fried vegetable dishes and even for deep frying indian snacks like poori, aloo-paneer bread pakoras (fritters) or even some sweets like sweet vermicelli, rava kesari halwa is prepared in the kadai. The recipe is roughly being adapted by Sanjeev Kapoor cookbook. 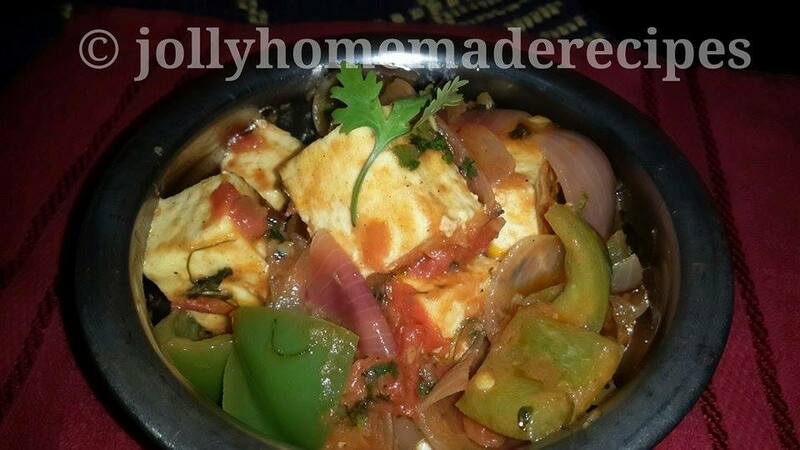 The restaurant in Bangalore serve two kinds of kadai paneer. 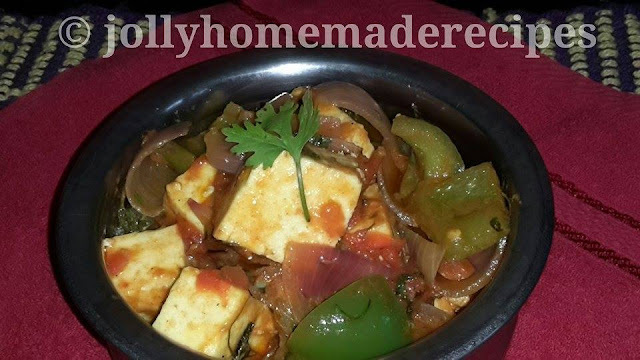 Kadai Paneer Gravy or kadai Paneer dry. The one I am sharing here today. It goes fantastic with tawa pulao or methi paratha or chapati or lachha paratha. Follow the recipe with step by step process with pictures and you have a truly restaurant style kadai paneer to relish. 1. Wash & cut the vegetables. 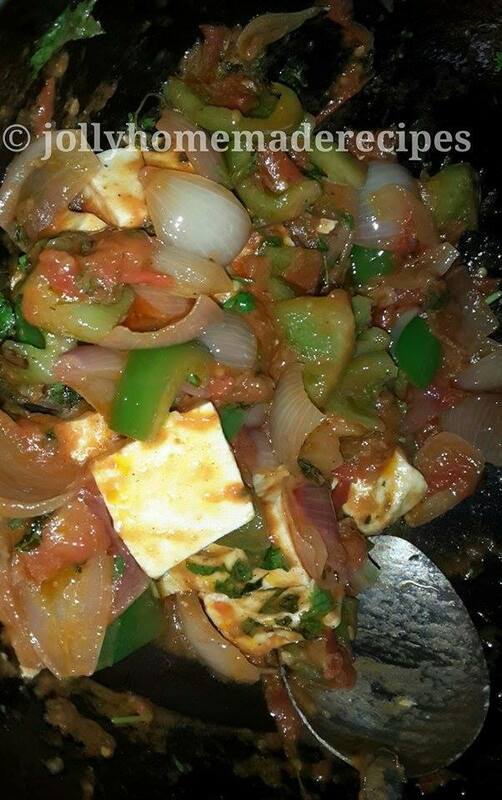 Keep paneer immersed in hot water until before you cook. 2. Heat oil in a pan/kadai and season with the coriander seeds. (You can crush it roughly too before seasoning.) But I added as such. Follow by adding ginger paste and give a quick fry. Add cubed onion, green chillies slit and fry till onion turns transparent. 3. 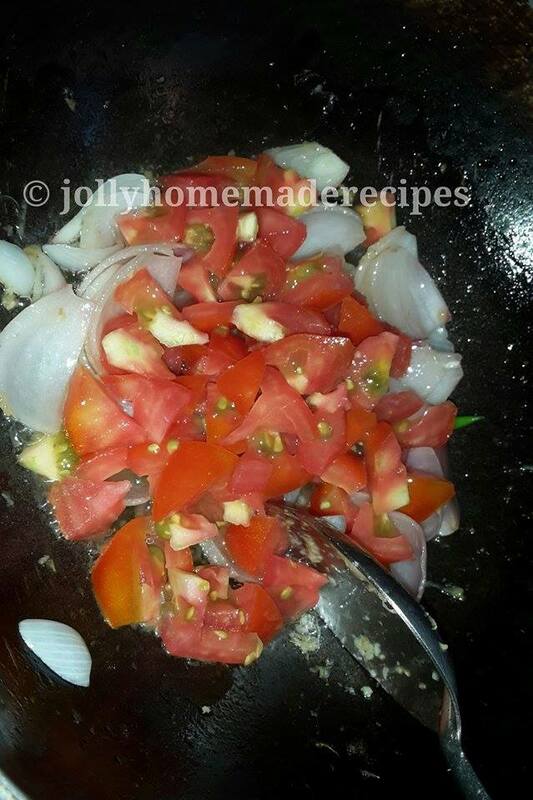 Add the chopped tomatoes and add salt, add all the spices - chilli powder, dhaniya powder, garam masala powder and turmeric powder. Fry till tomatoes turn gooey. 4. 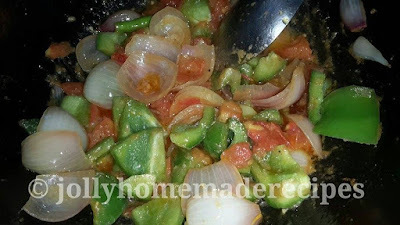 Continue frying till oil oozes out and then add the cubed capsicum and fry for 1 or 2 minutes. The crunchiness and color should not change. 5. 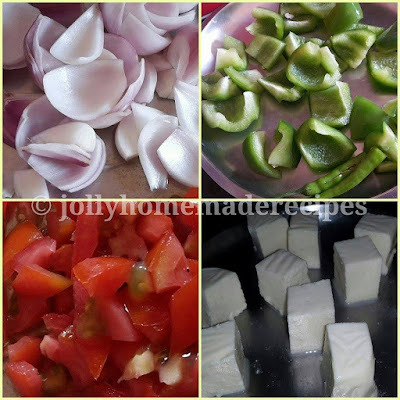 Add the paneer cubes (paneer cubes should be kept immersed in hot water till use) and crush the kasoori methi within you palms to powder it and add it to it. Add 1/4 cup of water and mix well. 6. Cook till the masala coats paneer well and the gravy is thick almost dry. Not too dry too. Add the chopped coriander leaves lastly and transfer to the serving dish. You can add ginger garlic paste in place of ginger paste. Use one tsp. 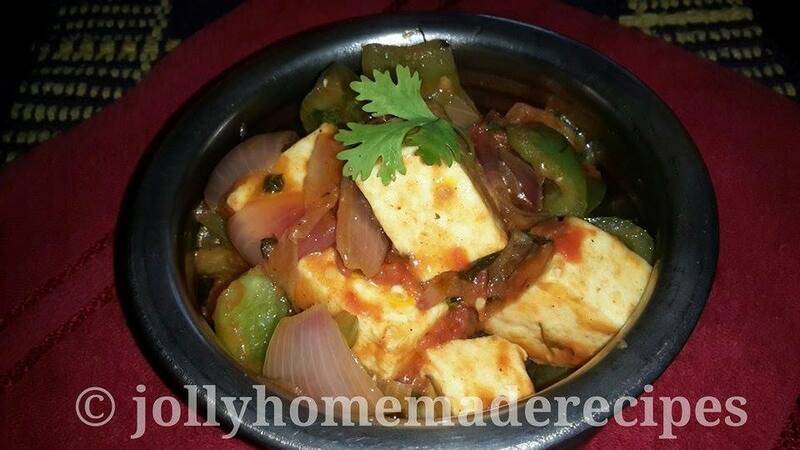 This dry paneer with green pepper is tempting, I like it with roti or naan. Thank you Herbs Spices and Tradition !! love it.. wonderfully described too!! Thank you so much Shubha !! Thank you so much MASTERCHEFMOM !! The thing over here is we hardly use paneer. Its mostly tofu which definitely will work well for this awesome dish. Hey Navaneetham, this goes very well with tofu also....Thanks dear !! Thank you so much Chetan ! !